The following is a list of cool searches that can be done with the Advanced Picture Searcher. Click on the links in the left column to automatically perform the cool search with the Advanced Picture Searcher. New pictures are constantly being added to the site, so more images will show up over time. So keep coming back. 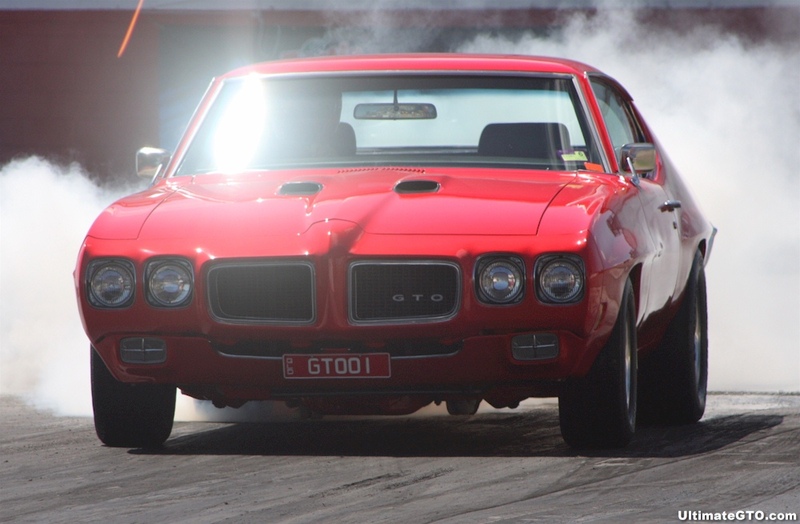 When site visitors send pictures of their GTOs, they often include entertaining stories about their experiences with their cars. So far, we've collected over 1000 stories - we could write a book! You can see them all by selecting the Pics with a Story option in the Ownership section of the Advanced Picture Searcher. Diamonds in the rough? Lost causes? Forgotten treasures? Why do we scan roadside junkyards and the back of peoples yards for rusted out Goats? This site contains tons of pictures of Goats out to pasture. You can see them all by selecting the Pasture Condition option in the Genetics section of the Advanced Picture Searcher. The Laws of Physics tells us "Gobs of torque and inertial resistance equals wheelie." Old Goats have tons of torque, they are massive cars, and they've been known to go airborne when coming off the line. We've collected a set of great wheelstands. You can see Goats getting some air by selecting the Wheelstand Setting option in the Picture section of the Advanced Picture Searcher. Do you have any pictures of bikini girls in front of GTO's? We do. You can see our collection of Girls-with-Goats by selecting the Girl option in the Picture section of the Advanced Picture Searcher. How about some action! Do you want to get your blood running on a cold winter day? You can see our collection of video clips by typing media player into the Keyword option in the Misc section of the Advanced Picture Searcher. Site visitors submit 100s of pictures of their GTOs every month! Do you have any you can submit? I post them as fast as I can. Watch for them with this search. You can see the newest ones by selecting the Posted 1 month ago option in the Picture section of the Advanced Picture Searcher. One of the factors that made the GTO a true muscle car was its advertising. It was shown with spinning tires, growling exhausts, and chromed engines. GTO magazine advertisements are huge collector items. You can see all the ads that we've collected so far by selecting the Advertisement Condition and GTO Model options in the Genetics section of the Advanced Picture Searcher. 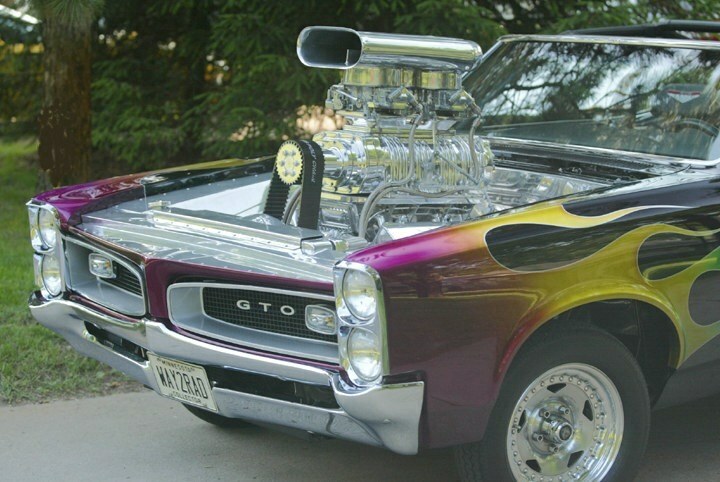 You cannot be a true GTO fan without having a GTO on your computer's desktop. We have wallpapers for your desktop containing great shots of GTOs, compilations, and GTO emblems. You can see all available wallpapers by checking the Wallpaper picture size checkbox in the Picture section of the Advanced Picture Searcher. The Ram Air V (five 5) engine never did get installed in a Pontiac at the factory. But some of the Ram Air V components are still around and some have been installed into lucky Goats. You can see all the RA5 GTOs we've collect by typing RA5 into the Visible Options section of the Advanced Picture Searcher. All engines are not tucked away hidden under the hood. Some poke through the hood for everyone to see. Then top that engine with a blower! We've collected some awesome blown Goats. You can see all them by typing blower into the Visible Options section of the Advanced Picture Searcher. People in other countries like GTOs too. In order to drive them in countries where you drive on the other side of the road, the car must be changed to right-hand-drive (RHD). A good right-hand-drive conversion produces an interior that is an exact mirror images of a stock left-hand-drive interior. We've collected pictures of right-hand-drive Goats. You can check them out by typing right hand drive into the Visible Options section of the Advanced Picture Searcher and checking the view interior checkbox. Want to show off your welding and engineering skills? How about welding the entire front clip on your Goat together then put a hinge on it? These guys did. You can check them out by typing flip front into the Visible Options section of the Advanced Picture Searcher. Dave Jeffries sent in his drawings of all 11 GTO model years!. They were so cool, that they were made Pictures Of The Week during 11 weeks in 2001. Later he sent a drawing of a 1970 LeMans. You can see all his drawings (including photos of his 1970 LeMans) by typing Dave Jeffries in the Owner field of the Ownership section of the Advanced Picture Searcher. The old station wagon... The mini-van of the past... Take an old LeMans or Tempest wagon and add the GTO options and you have one tough looking kid mover. You can see photos of all the GTO wagons we've collected by selecting the Wagon Roof Type option of the Genetics section of the Advanced Picture Searcher. Check out the Search Log to see what others are searching for. Go bookmark the MAIN PAGE to see All the latest changes. Says Michael Umney (umney. @madasafish.com) - "Very professional. I like the little car that drives across the first page."